The Pilanesberg game reserve is situated on the remains of an extinct alkaline volcanic crater that was active a few thousand years ago. The park's rare rock types and structures make it a unique geological feature. The park is also known as "The Volcano that gave birth to a game reserve". It differs to Tanzania's Ngorongoro Crater in that its volcano walls have collapsed inward thereby making many small hills inside the park as opposed to Ngorongoro crater that still has its wall intact. Is it a 'game reserve' or 'national park' I hear you asking? Well it's both! The park does not fall under the control of SANParks (South African National Parks), instead it is controlled by the North West provincial government. So strictly speaking the park is not a national park but it is a big-five park and the third or fouth biggest park in South Africa and the North West government considers it a 'national park'. So if we keep politics out of it then the park is not just a game reserve but also a national park. 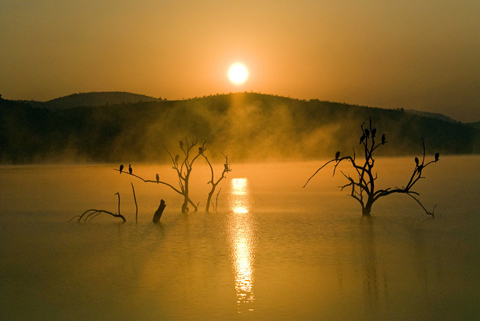 Lake Mankwe sits in the centre of the park and is the park's focal point. When the summer rains fall the hills channel the water to the lake thereby keeping the lake full for most if not all the year. Each lodge has a swimming pool, curio shop, and restaurant. Black Rhino Game Reserve is a private concession on the western side of the park, which has mainly private lodges but a few commercial ones as well. We stayed at Pilanesberg Private Lodge and had a great time there. 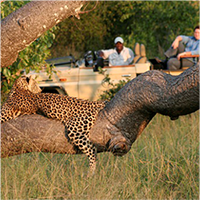 The park is about 200 kilometers from Johannesburg so an easy 2-hour drive. You may want to stay at a safari stopover depending on where you are travelling from. In 2016 a new camp opened up called Pilanesberg Tented Safari Camp. It is based in the Manyane complex and is a great experience for those of you who love camping but don't want the hassle of setting up camp, and cooking. The concept is called 'glamping' - camping in luxury, where everything is done for you! Petrol (gas) stations are found just outside the park near each gate. You also have the option of staying at Sun City and visiting the park just for a morning or afternoon drive - there are many tour and safari packages to choose from should you not want to do a self-drive safari. •	Hot Air Balloon Safaris are offered by Airtrackers, which is a division of Gametrackers. 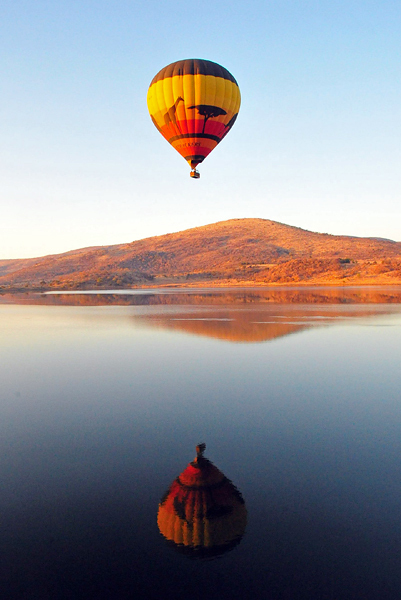 These hot air balloon rides are superb and should be on all visitors bucket lists! •	What we like about the Park is that animals that are difficult to see in other parks are easily seen here - animals such as white rhino, black rhino, eland, sable, tsessebe, brown hyena and red hartebeest. •	Buffalo, which are common in the Kruger, tend to be a challenge here and we have had just two sightings of these elusive animals! 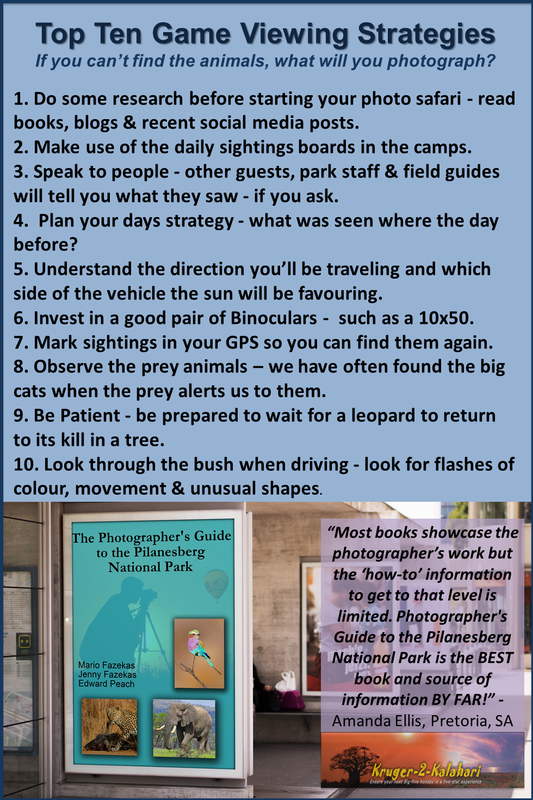 •	The bird hides are very rewarding for wildlife photographers so you should make a point of spending a few hours at each hide, especially in the winter months of June to September for mammals and all year for birds. 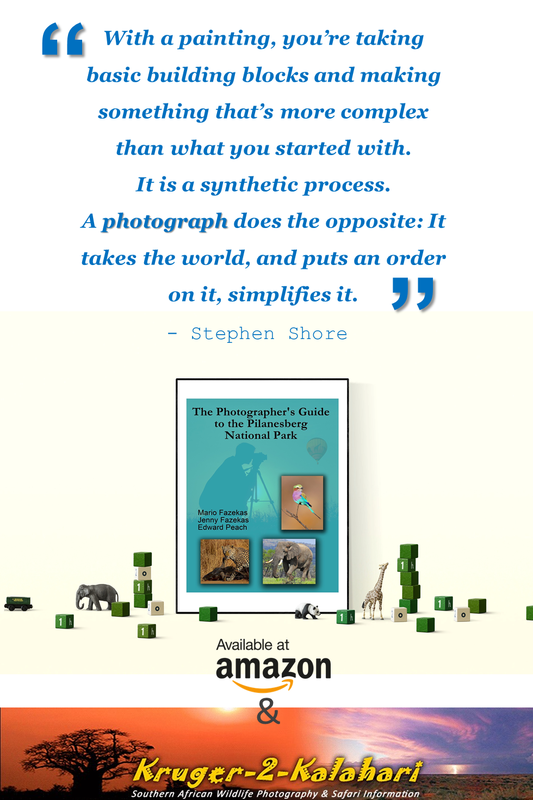 • Edward Peach was is a wildlife photographer and game ranger in the park and his interview makes very interesting reading. 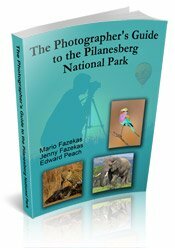 • Click here to download a PDF article we wrote called 'Shooting Volcano-scapes in South Africa's Pilanesberg National Park'.